This review has been printed in the February 2019 issue of Chess Life. A penultimate (and unedited) version of the review is reproduced here. Minor differences exist between this and the printed version. My thanks to the good folks at Chess Life for allowing me to do so. Keene, Raymond, and Byron Jacobs. Carlsen v Caruana: FIDE World Chess Championship London 2018. London: Everyman, 2018. ISBN 978-1781945131. PB 208pp. Konikowski, Jerzy, and Uwe Bekemann. World Chess Championship 2018: Fabiano Caruana vs. Magnus Carlsen. Eltmann: Joachim Beyer Verlag, 2018. ISBN 978-3959209816. PB 184pp. Gustafsson, Jan, Peter Heine Nielsen and Laurent Fressinet. Inside the 2018 World Championship Match. video series, available at chess24.com. With so many drawn games in both the 2016 and 2018 matches, and with players facing such difficulties generating chances with the White pieces, many pundits are proposing fairly radical changes in match structure and time controls. To me this seems slightly overwrought – two matches are a small sample, after all – but it mirrors a definite trend towards faster chess at the highest levels. But perhaps the real story of the 2018 match will, in retrospect, have been the full arrival of chess as an e-sport. Today an ever-increasing number of major tournaments are streamed on YouTube and Twitch, including the US Open and US Chess National Scholastics, and some competitions (like the Pro Chess League) are now contested entirely online. 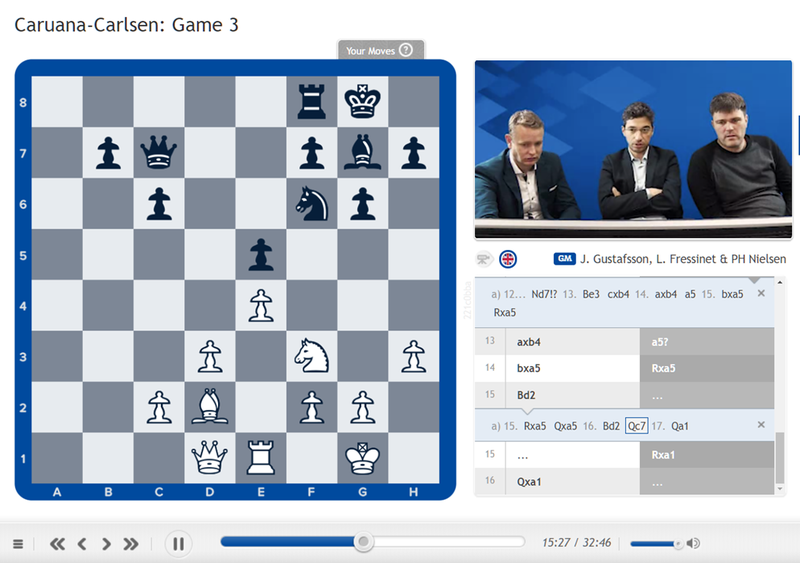 At least four major chess media outlets – chess.com, chess24.com, the Saint Louis Chess Club, and Agon / Worldchess – offered real-time English language streaming commentary on the Carlsen-Caruana match. Others, including chessbase.com, chessclub.com, and uschess.org, offered post-game wrap-ups and analysis. It’s worth spending a bit of time discussing the four competing live video streams, both to understand the novelty of their coverage as well as their limitations. Danny Rensch and fellow Chess Life columnist Robert Hess hosted the chess.com coverage. Multiple guests appeared on the livestream, including Levon Aronian, Hikaru Nakamura, Sam Shankland, Wesley So, Maxime Vachier-Lagrave, and Hou Yifan. Shankland provided the majority of the post-game annotations for chess.com readers, and everyone’s favorite “Uncle Yermo” Alex Yermolinsky recorded the post-game video wrap-ups. Chess fans were treated to a veritable Murderer’s Row of chess commentators at Chess24. Peter Svidler and Alexander Grischuk were joined by Sopiko Guramishvili (Games 1-8) and Anish Giri (Games 9-12 and tiebreaks) for the live analysis, and Svidler recorded the post-game summary videos. The Saint Louis Chess Club’s “A-Team” of Maurice Ashley, Yasser Seirawan and US Chess Senior Digital Editor Jennifer Shahade returned to helm the Saint Louis coverage of the match. Here too guests added spice to the proceedings, including Viswanathan Anand, Garry Kasparov, and Vladimir Kramnik. Frequent STLCC broadcaster and Caruana second Cristian Chirila checked in from London. All three of these streaming platforms provided their video to viewers on YouTube or twitch.tv free of charge. None were permitted to use live footage from London. Another option – worldchess.com, the paid broadcast arm of match organizers Agon – offered exclusive video of the players along with commentary from Judit Polgar, Anna Rudolf, and on-site guests like Demis Hassabis, one of the creators of Alpha Zero. While the cost to view the Worldchess stream was a reasonable $20, early reports of website instability and login problems spooked me. So I ended up flipping between the chess.com, chess24 and Saint Louis streams on my Roku Player. With competition comes choice, and I felt that the three free streams were aimed at somewhat different audiences. Chess.com pitched its coverage towards gamers and enthusiasts. Chess24 tried to capture more serious players and students of the game. Saint Louis was the natural destination for American fans and a broadly pro-Caruana audience. Most of my time was spent with chess24, and in no small part because of their general no-engine policy. There is little I enjoy more than watching vastly strong players analyze, and getting to see how Giri, Grischuk and Svidler worked through difficult positions together was a most welcome treat. If the various streams had a common weakness, it was a certain modicum of perspective due to the real-time nature of the medium. 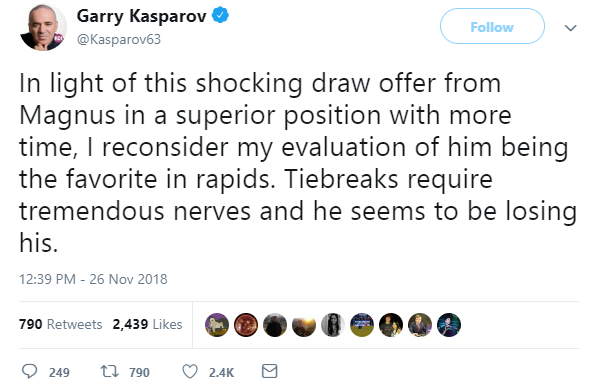 “Hot takes” are quick and easy, but perspective requires time and critical distance, as no less than Garry Kasparov learned when he tapped out this ill-fated Tweet after Game 12. Full disclosure: I may have enthusiastically retweeted this. It’s vitally important, today more than ever, to resist the equation of instant analysis with veritable truth. There’s a reason that good writing and commentary take time, particularly in chess. Engines provide the illusion of accuracy and understanding, but authors can only begin to peel back the surface of events by standing back from them. Here is where match books have traditionally been important. The problem, as I noted in December 2017, is that such efforts are increasingly rare, and the titles that do appear are often slapped together to make a fast buck. There’s nothing intrinsically wrong with such books – authors and publishers have to eat too! – but the results are usually unsatisfying, the literary equivalent of a greasy fast food meal. Everyman’s Carlsen v Caruana: FIDE World Chess Championship London 2018, released two weeks after the match closing ceremonies, is the definition of an “instabook.” Everyman editor Byron Jacobs teamed up with Raymond Keene, well known for his proclivity for borrowing texts both from his previous works and from those of others, to produce a thoroughly forgettable work. Game annotations make up the bulk of Carlsen v Caruana, and while there are some oddities – playing an unforced Bxc6 in the Rossolimo, for example, was Chebanenko’s idea and not a Fischer invention, and Woody Harrelson’s accidental ‘king tip’ before Game 1 was a prearranged joke – they are serviceable if hardly groundbreaking. The book’s front matter, however, is another story entirely. Large chunks of text in Carlsen v Caruana are recycled from previous Keene writings. The Introduction, “World Chess Comes to London,” is a verbatim reprint of his preface to the Summer 2018 issue of Synapsia, the house magazine for Keene’s Brain Trust Charity, and one of the final paragraphs reappears in his September 15th newspaper column. The “History of the World Championship” section is similarly self-referential, with many multiple paragraphs taken directly or closely paraphrased from previous Keene books, with The Brain Games World Championship 2000 being just one example. Reusing one’s own text is not illegal or immoral, but the fact that the reuse is so blatant, and that Keene has made such a career of it, leaves something of a bad taste here. Couple this with the editing and spelling problems – “Kieseritsky,” “Vesselin Topalov,” and World Championship “Finallist” Nigel Short are but a small sample – and Carlsen v Caruana must be seen as something of a disappointment, failing to add anything new to the literature. World Chess Championship 2018: Fabiano Caruana vs. Magnus Carlsen, written by Jerzy Konikowski and Uwe Bekemann for the German publisher Joachim Beyer Verlag, proves that a rapid-response title can be done competently. The translation is a bit wonky – for some reason “World Championship” becomes “World Cup,” “and” is occasionally “und,” etc. – but the authors generally succeed in creating an original, accessible account of the match. Konikowski and Bekemann aim to offer readers a “complete picture” (8) of the players by sketching Carlsen and Caruana’s careers and analyzing a selection of their pre-match encounters. Artur Yusupov and Karsten Müller provide useful insight into the players, and Müller’s contribution of fifteen annotated games meets his usual standard of analytical excellence. Only the combination section, featuring 24 positions from Carlsen and Caruana’s practice, seems extraneous. Notes to the match games make up more than half of World Chess Championship 2018. There is less ‘color’ here than in Carlsen v Caruana, and the notes (save the excessive opening citations) tend to be terser. Konikowski and Bekemann’s book is certainly preferable to Jacobs and Keene’s, although it too left me wanting more. So it is perhaps a sign of the times that, with no other match books on the horizon, the most insightful treatment of the Carlsen-Caruana match is – you guessed it – an online video series. Chess24 viewers were surprised when Jan Gustafsson, the public face of the website, was absent from the Game 1 coverage. While Svidler gamely tried to maintain operational security, we learned only after the match concluded that Gustafsson was holed up in Thailand, working remotely for Team Carlsen. 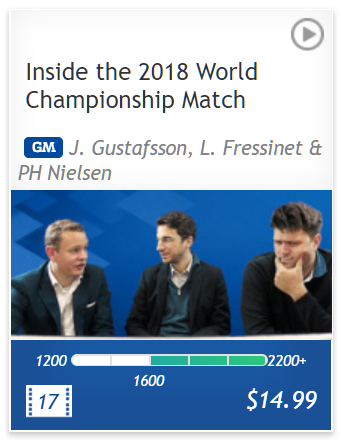 Over the course of nearly eleven hours of video, Gustafsson and fellow Carlsen seconds Peter Heine Nielsen and Laurent Fressinet walk viewers through the highs and lows of the match in Inside the 2018 World Championship Match. The result is an embarrassment of riches, the likes of which I can only begin to describe here, and the series stands as one of the most intimate accounts of a World Championship Match ever produced. Only From London to Elista by Evegny Bareev and Ilya Levitov can compare to it. Impatient viewers – count me among them – might want to start with the final “Wrap-up” video, where Team Carlsen discusses the opening battles, Nakamura’s claim that Caruana dominated the Classical games, the question of whether Carlsen’s title was diminished by winning in tiebreaks, and how different team members worked during the match. Still, fascinating as the reflections on the match metagame were, the individual game analyses were better. Take the coverage of Game 10. Gustafsson, Fressinet and Nielsen describe quite frankly how they missed 12.b4 in their preparation, discussing typical plans for both sides and citing Alpha Zero analysis. They speculate on the psychology of the moves leading up to the critical position after move 23, and Nielsen borrows a line from an Anand video to help us understand Caruana’s all-too-human 24.g3. The positions after 24.Bxb5, he says, are the sort where if the computer told you either White or Black were +1.5, you’d believe it. This is an important insight, and the emphasis on the human factor in the match is a key theme in the series. Comparing books and videos is a bit of an apples and oranges endeavour. Books take longer to write – in most cases, anyway! – and there are production and distribution costs for print materials that do not exist for video platforms. Those considerations aside, it’s clear that Inside the 2018 World Championship Match is the best treatment of the Carlsen-Caruana match, and by some distance. At $14.99 it’s also cheaper than the Keene / Jacobs and Konikowski / Bekemann books. The series is a real coup for Chess24, and I recommend wholeheartedly. It’s worth noting once more, as I did in my December 2017 review, what a welcome departure from this practice Alburt and Crumiller’s outstanding book was. This entry was posted in Game Collections, video and tagged 2018 World Chess Championship, Carlsen-Caruana, Chess24, Chess24.com, Fabiano Caruana, Jan Gustafsson, Jerzy Konikowski, Magnus Carlsen, Raymond Keene, Uwe Bekemann on February 3, 2019 by fullcityplus. This review has been printed in the March 2017 issue of Chess Life. A penultimate (and unedited) version of the review is reproduced here. My thanks to the good folks at Chess Life for allowing me to do so. Gustafsson, Jan. A repertoire against 1.d4. Part 3: Nimzo-Indian Defense. Available at Chess24.com as part of the Premium Membership or a la carte for $12.99. If market competition leads to improved choices for consumers, chess players are reaping the rewards of the ongoing online chess arms race. Playing sites are rushing to add exclusive content like instructional videos, live event commentaries, and (of course) endless sessions of Banter Blitz. Chess24 is one of the newest kids on the block, and since being founded in 2014, it has come to challenge for a leadership position in the world of online chess. A driving forces behind this ascent is the German Grandmaster Jan Gustafsson, who plays the dual role of onscreen talent and website co-founder. Widely respected for his theoretical knowledge – Magnus Carlsen employed him as a second for the recent World Championship Match – Gustafsson appears to have largely set aside his playing career to focus on teaching and Chess24. He provides some of the best live commentaries of major events around, particularly when paired with Peter Svidler, and his blitz sessions against site subscribers are entertaining and instructive. This month we take a look at one of Gustafsson’s new set of videos for Chess24 on the Nimzo-Indian (1.d4 Nf6 2.c4 e6 3.Nc3 Bb4). “A repertoire against 1.d4. Part 3: Nimzo-Indian Defense” is part of a larger series against 1.d4, following up efforts on the Catalan (1.d4 Nf6 2.c4 e6 3.g3) and the Vienna (1.d4 Nf6 2.c4 e6 3.Nf3 d5 4.Nc3 dxc4). With promised videos on 1.d4 sidelines like the London or Trompowsky forthcoming, Chess24 subscribers should soon have access to a complete 1.d4 repertoire for Black. Video cannot compete with the written word when it comes to density of information transfer, but it makes up for that shortcoming with easy accessibility. The Nimzo series consists of 13 videos that, taken together, add up to just over four hours and 12 minutes of content. While Gustafsson can only sketch his recommended lines in that time, he does an admirable job of presenting the essentials. The repertoire offered in this series is fairly technical, something typical of most of Gustafsson’s opening videos. This is most clear in his discussion of two of White’s most important tries in the Nimzo. Against 4.Qc2, Gustafsson recommends that we play 4…0-0 and head towards lines (following recent Kramnik games) where we aim for …b6 and …Ba6, exchanging the light squared bishops. 4.e3 is also met with 4…0-0, but here paths diverge. Gustafsson presents the new and trendy 5…c6 against the Reshevsky Variation (5.Nge2), and he prefers to meet both 5.Bd3 c5 6.Nge2 and 6.Nf3 with lines that saddle White with an Isolated Queen’s Pawn. The games of Anatoly Karpov are our guide here, and one of the longest videos in this series – second only to the coverage of 4.f3, in fact – is devoted to the so-called ‘Karpov Variation’ after 4.e3 0-0 5.Bd3 c5 6.Nf3 d5 7.0-0 dxc4 8.Bxc4 cxd4 9.exd4 b6. Other recommendations include meeting the aforementioned 4.f3 with 4…c5 5.d5 b5 6.e4 0-0. The Samisch is handled in classical fashion with 4.a3 Bxc3 5.bxc3 c5 6.e3 Nc6 and Black plays against the doubled c-pawns. Both 4.g3 and 4.Nf3 are met with 4…0-0, and there is also sufficient (if sometimes slight) of sidelines like 4.Bg5, 4.Bd2 and 4.Qb3. Some of Gustafsson’s choices are deeply theoretical, and because he is limited in what he can say in a video of reasonable length, some lines require further study. The coverage of the Karpov Variation feels light to me given its strategic complexity, and some of the variations – most notably 4.Qc2 0-0 5.e4 d5!? 6.e5 Ne4 – are very sharp and forcing. Here is where a good accompanying eBook would be of great value. Some Chess24 video series feature such eBooks, and some (like Peter Svidler’s on the Grunfeld) are tremendously useful. Unfortunately the eBook for this series is rather wanting. There is some new analysis to be found within, particularly in the Reshevsky Variation, but the expansiveness varies and the analysis curiously lacks terminal evaluations. I don’t think that a Grandmaster would use Gustafsson’s videos as the basis for an opening repertoire, but then, I don’t think that Gustafsson made these videos for Grandmasters. His target audience seems to be the ambitious amateur player, one who doesn’t mind theory and who tends to prefer technical positions over outright slugfests. The variations presented in “A repertoire against 1.d4. Part 3: Nimzo-Indian Defense” are solid and reliable, and with a bit of home study, they could form an integral part of a player’s repertoire. This entry was posted in Openings, video and tagged Chess24, Chess24.com, Jan Gustafsson, Nimzo-Indian on March 1, 2017 by fullcityplus. This article has been printed in the December 2016 issue of Chess Life. A penultimate (and unedited) version of the review is reproduced here. My thanks to the good folks at Chess Life for allowing me to do so. After learning of the death of Mark Dvoretsky on September 26th via Twitter, I found myself standing in front of my bookshelf, thumbing through one of his many titles. Suddenly I found myself hurled back in time, much like Proust after biting into his madeleine, and in unpacking that involuntary memory, I came to understand why the news of his death had affected me so. I am old enough to remember a time before the ‘disenchantment’ (to borrow a phrase from the sociology of religion) of the modern chess world, a time before everyone had a Grandmaster in their cell phone and the Internet brought tournaments from around the world into our homes. In the days before the computer, master-level play had yet to be demystified. Amateurs had almost no access to the thought processes of masters and Grandmasters, and without the false security provided by the engine, we rarely understood their moves. All of this changed when Mark Dvoretsky’s Secrets of Chess Training was published in 1991. Standing there in my basement, I was 15 years old again, wandering through the local Waldenbooks and discovering a pink book that promised to teach me the secrets of chess. I remember struggling to make sense of the analysis within, and how I persisted in doing so, even when it was evident that I lacked the ability to understand any of what I was reading. Others may not have shared my fruitless dedication, for legend has it that USCFSales stopped stocking the book after too many frustrated returns. Mark Dvoretsky will be remembered for many reasons. He worked with three World Junior Champions, a Women’s World Championship Challenger, and a myriad of masters and Grandmasters, earning him the unofficial title of “World’s Best Trainer.” He was a very strong player in his own right, winning the Moscow Championship in 1973, the Wijk aan Zee B tournament in 1974, and finishing =5th-7th in the 42nd Soviet Championship. Dvoretsky’s rating peaked at 2540 in January 1976, making him the 35th ranked player in the world at the time. He was also, by all accounts, an honest and decent man. For all of these accomplishments, I think Dvoretsky’s true legacy lies in his writings. Very few authors contribute something radically new to chess theory, and Dvoretsky, with the possible exception of his concept of the ‘superfluous piece,’ was not an iconoclast. (Pieces, and particularly knights, become superfluous when two or more aim at one square.) Instead, he took the best elements of the Soviet training system, added his own twist – the solving of problems from his famed collection of positions – and shared the fruits of his labor with the world. It’s not simply that his books are well written, although of course, they are. There is something about Dvoretsky’s style, something intimate – ‘here is what Yusupov saw… here is what Dreev missed’ – that remains powerful, even in the age of the silicon beasts. We are not merely allowed to peek inside Dvoretsky’s chess laboratory. We are invited to join in the search for truth, and in his writings, this task feels as important and vital as anything in the world. There are two ‘halves,’ as it were, to Dvoretsky’s authorial career. His nine books (seven of which are revised and extended versions of books originally published with Batsford) and two series with Edition Olms made him famous. We will examine them first before turning to more recent titles published with Russell Enterprises. The School of Chess Excellence (SCE) series consists of four titles published from 2001-2004: Endgame Analysis (SCE 1), Tactical Play (SCE 2), Strategic Play (SCE 3), and Opening Developments (SCE 4). In his recent video series for Chess24 – which I highly recommend for the newcomer to Dvoretsky’s work, and to which I will return shortly – Dvoretsky says that these four books are best understood as “one big book,” covering a wide array of ideas in essay form. The School for Future Champions (SFC) series takes its name from the chess school run by Dvoretsky and Yusupov from 1990-1992. The five books in the series – Secrets of Chess Training (SFC 1; not the same as the 1991 title, now SCE 1), Secrets of Opening Preparation (SFC 2), Secrets of Endgame Technique (SFC 3), Secrets of Positional Play (SFC 4), and Secrets of Creative Thinking (SFC 5) – were published from 2006-2009 and based on lectures for talented children. While Dvoretsky and Yusupov wrote the bulk of them, guest lecturers like Kaidanov, Kramnik, and Shereshevsky also contributed. Taken together, these nine titles represent a fairly systematic curriculum for chess mastery. What does that curriculum look like? Interestingly we find the clearest accounts of Dvoretsky’s ‘philosophy’ in his writings on the endgame, including chapters in SCE 1 (“The Benefit of Abstract Knowledge”) and SFC 3 (“How to Study the Endgame”). A particularly cogent articulation also appears in his “Endgames with Dvoretsky” video series for Chess24, released mere weeks before his death. How do we do this? Through the conjoined tasks of study and solving. Dvoretsky offers a vision of how this might work in SFC 1, a book that IM Greg Shahade has called “the best instructional chess book of all time.” Players should increase their knowledge of general principles and ideas through the study of chess classics and rigorous self-analysis. Solving carefully chosen exercises reinforces what has been learned and boosts calculative, evaluative and imaginative skills. Enriching intuition in this way allows players to correctly apply relevant rules or principles in novel situations. We can see the value of this training method in this adjourned position (SCE 1, 64-7; also, Chess24, “Endgames with Dvoretsky”), taken from the 1980 Candidates Match between Nana Alexandria and Marta Litinskaya. What should White play after the sealed 41…Rf8? One idea would be use the opposite-colored bishops to construct a fortress. Initial analysis showed that this was difficult: if 42.Rd2 then Black plays 42…Rf4! and White has multiple weaknesses while Black’s pieces are active. Dvoretsky, who was Alexandria’s second, quickly intuited that another rule – positions with rooks and opposite-color bishops favor the attacker – was more applicable here. Activating the rook was necessary. But how? 42.Ke1?! seemed a likely choice, but after 42…Rf4! 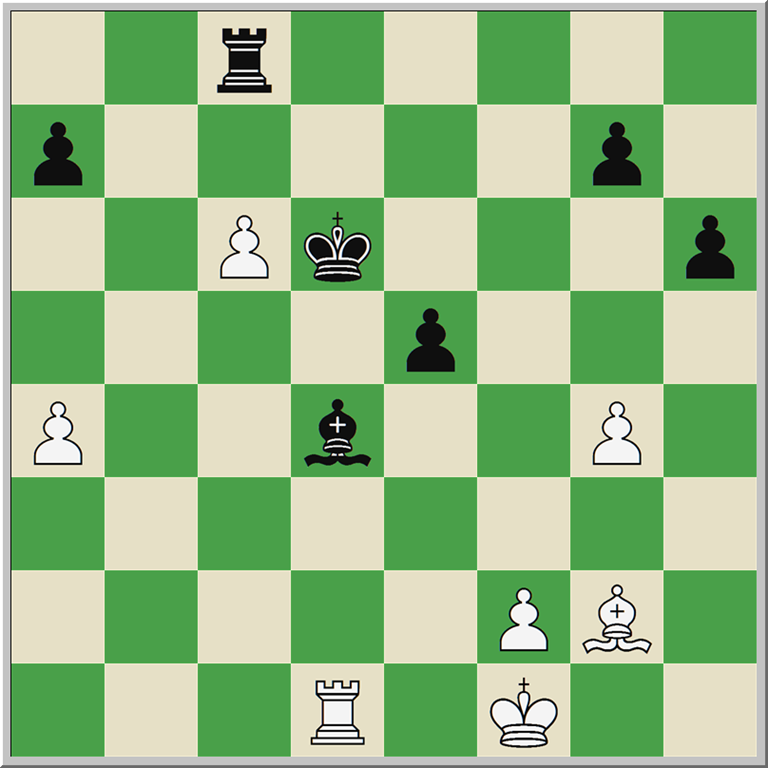 43.Rc1 (if 43.a5 Rxg4; Modern engines prefer 43.Rd3!? Rxg4 44.Rg3 Rxg3 45.fxg3 and the endgame is probably drawn) 43…Bxf2+ 44.Kd1 Bb6 Black kept the advantage. Only 42.Kg1! was sufficient to save the game. Black’s best chance lay with 42…Rf4 43.a5! (stopping Bb6; 43.Rd3!? is possible here too) 43…Rxg4 (if 43…Kc7 44.Kh1! Rxg4 45.Rb1! (with the idea of Rb7+) 45…e4 46.Rb4 Rh4+ 47.Kg1 Bxf2+ 48.Kf1! and White draws after exchanging rooks) 44.Rc1 Kc7 45.Rb1 e4 46.Rb4 Bxf2+ 47.Kf1! Be1! 48.Ra4!! and analysis shows that White can draw. Had Dvoretsky’s authorial career ended with those nine titles, his position in chess history would have been secure. Luckily for us, he kept writing. His books with Russell Enterprises are some of his best, extending his earlier work and opening up new avenues of inquiry. Unfortunately I cannot discuss all of Dvoretsky’s books with Russell for lack of space, but merely touch on the highlights. In particular I want to thematize two signature features of Dvoretsky’s work – prophylaxis and the use of endgame studies – as they appear in his later books. Dvoretsky’s Endgame Manual (DEM) was published in 2003 to tremendous and deserved acclaim, and is now in its 4th edition. It consists of 1100+ examples and exercises, using novel textual devices to demarcate 220 ‘precise positions’ for memorization (blue print) and dozens of typical endgame schemata (bold italics). DEM is perhaps Dvoretsky’s best book, and certainly his best known. It is widely recommended by top teachers to those looking to learn endgame theory. Although he did not invent it, Dvoretsky is often associated with the concept of prophylaxis or prophylactic thinking. Prophylaxis requires that players consider what the opponent wants to play were she on move, find an answer to that question, and then use that answer to help guide analysis. This idea is discussed in SCE 3 (“Don’t Forget about Prophylaxis!”) and SFC 4 (“Prophylactic Thinking”), but I think Dvoretsky’s clearest rendering comes in Recognizing Your Opponent’s Resources (2015). The book is the Platonic ideal of Dvoretsky’s training philosophy, containing hundreds of exercises for solving and clear examples to orient intuition. Endgame studies are also a key component of Dvoretsky’s methodology, and in two ways. Solving studies can be useful in training imagination and calculation, and they can also be used as set pieces for ‘two-handed play’ between training partners. (SCE 1, 207, 200) His interest in studies spans his publishing career, with a full book – Studies for Practical Players (2009, co-authored with Oleg Pervakov) – devoted to the topic. Dvoretsky described solving studies in SCE 1 as “pleasant, but useful.” Much the same can be said for the study of his books. So long as chess is played, Mark Dvoretsky’s books will be certainly be read, both for pleasure and for improvement. This entry was posted in biography, history, Instructional and tagged Chess24, Dvoretsky, Dvoretsky's Endgame Manual, endgame studies, Endgames with Dvoretsky, Mark Dvoretsky, prophylaxis, School for Future Champions, School of Chess Excellence on November 25, 2016 by fullcityplus.